Dufferin Grove Park is not a social work agency and so we don't try to find people who are in trouble. But when trouble finds us, we try to follow it up. Last January a long-time friend of the park was at the Manulife Centre with her kids. While she tried to find out some information from the building staff, a man grabbed her eldest (10-year-old) daughter and tried to pull her along with him. The plucky kid resisted and he was arrested soon after. It turned out that Tri Van Huynh had done similar stuff before and had a police record. It also turned out that he lives in this neighbourhood, across from the Dovercourt Y. The police published his photo on their web site and most people around here have already seen it. Beautiful market day on solstice December 21, thank you to all who came to support me and pick up their fruitcakes. Something very unfortunate happened though, which is that my BIKE WAS STOLEN. As many of you may feel about your own bikes, this is my vehicle--this baby has ridden me up to Haliburton. 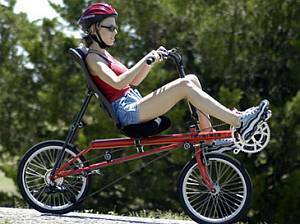 It is a recumbent bicycle, it has a reclining seat and your feet go in the front. You likely have seen it at the market before as I have ridden it there the last three years. Imagine a big backed chair mounted onto a bicycle. The frame is RED and all other details are black. It has small wheels. You would turn your head if you saw someone riding it. It was last seen parked and locked next to the gardens on the main path to the big oven about 6pm, and was gone by 7:30pm when I came out to pack my bags. The bike was locked to itself so they had to pick up the bike and walk with it. There is a bike rack on the back with two bags and a turquoise bell. I have reported this to the police and they have the serial number on record. If you spot this bike please call the police dispatch 416 808 2222, and let me know also. Thank you for keeping your eyes open...Maria.